We’d love your help. Let us know what’s wrong with this preview of Tartine Book No. 3 by Chad Robertson. 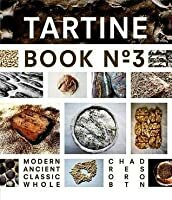 To ask other readers questions about Tartine Book No. 3, please sign up. (1) Robertson needs an editor with a sharp eye. Several of the recipes have mistakes and confusing instructions. Some procedures are described using certain terminology on one page and then it changes on the next. There are few chefs/bakers who can write perfect recipes, so I don't hold it against him. But it definitely lowers the quality of the book. Artisan bread is where it's at right now - tasty, trendy, and Tartine. I enjoyed the pictures and the stories. Chad Robertson is, indirectly, the reason I bake bread every weekend. I don't actually make the bread the way he does, though I may someday. Bread fascinates me at this moment and I'm reading every bread book I can get my hands on. Definitely recommended, although I had trouble with the hardback book having to be turned sideways to read some of the sections. Too difficult, I just paged on through. A co-worker just informed me that if I were in jail, I could call her for getaway assistance, on the strength of my sesame wheat bread. I then made two more Tartine #3 loaves in progress, one oatmeal porridge/walnut oil, and one sprouted kamut. These showcase two of the newer techniques in the book, so I'm interested to see how they do. I added a touch of dessicated coconut flake to my oats, which I'm hoping will add something. The oat and the Kamut were good--the sprouted amaranth was on the bitt A co-worker just informed me that if I were in jail, I could call her for getaway assistance, on the strength of my sesame wheat bread. 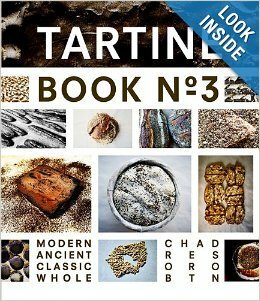 This is the first Tartine book I've purchased, and I got it because it's an exploration in baking with freshly-milled whole grains, and more diverse and ancient grains than just wheat. And also because the Tartine crew has a solid reputation for quality and authenticity. The recipes in this book tend to be very ambitious and advanced. I consider it aspirational as opposed to instructional, at least for the amount of time and energy I'm currently able to commit toward baking. The pastry section i This is the first Tartine book I've purchased, and I got it because it's an exploration in baking with freshly-milled whole grains, and more diverse and ancient grains than just wheat. And also because the Tartine crew has a solid reputation for quality and authenticity. The recipes in this book tend to be very ambitious and advanced. I consider it aspirational as opposed to instructional, at least for the amount of time and energy I'm currently able to commit toward baking. The pastry section is a bit more accessible than the breads, and the two recipes I've made so far from it so far have been wonderful. The Buckwheat Tart with Honey-Lemon Cream was decadent and happens to be gluten-free, and was in no way a compromise to the taste of a typical tart that uses processed flour. The recipe for the 50/50 Sables provides several grain/nut combos as suggestions which makes it adaptable to what's in the pantry. This cookie (at least the way I made it with pecans and rye flour) was not too sweet -- a grown-up, sophisticated cookie. A friend commented that it would be great with coffee, and while not a coffee drinker myself, I knew instantly what she meant. This book is overwhelming and brilliant at the same time. It simultaneously gives too much information and not enough information. I'm in love with every loaf of bread on these pages and I get the impression the author makes his method difficult to understand so that only people insanely dedicated to the art of making naturally leavened bread will attempt it. For those crazy enough to really go for it I imagine there will be many disappointments before lightning strikes. I'll probably be one of This book is overwhelming and brilliant at the same time. It simultaneously gives too much information and not enough information. I'm in love with every loaf of bread on these pages and I get the impression the author makes his method difficult to understand so that only people insanely dedicated to the art of making naturally leavened bread will attempt it. I liked this one more than I did the Tartine Bread (3,5/5). Partly because it offers a wider range of flours and recipes, and partly because it seems slightly less pretentious than the previous one. Problem is... if you are a domestic baker and not a professional one, you will struggle getting all of the ingredients. So a lot of recipes are again not targeting a beginner/occasional baker, but rather those who bake professionally or have a good source for all these ingredients (a local mill or se I liked this one more than I did the Tartine Bread (3,5/5). Partly because it offers a wider range of flours and recipes, and partly because it seems slightly less pretentious than the previous one. Problem is... if you are a domestic baker and not a professional one, you will struggle getting all of the ingredients. So a lot of recipes are again not targeting a beginner/occasional baker, but rather those who bake professionally or have a good source for all these ingredients (a local mill or several for that matter). Might I also add that as much as these ingredients sound great (and some honestly are), they definitely do not come cheap. I really don't see home bakers spending hundreds of pounds, to produce a few loaves per month, maybe even with a hit and miss loaf in between and consequently never using that 16/25kg bag of grains ever again. The pastry section is probably more realistic for a domestic baker than the bread one is. Most ingredients are widely accessible and the procedures are not overly complicated. Nevertheless for me, as a professional baker, it offers a nice range of new ideas to ponder over and try some of them out, maybe tweak them a bit to get something that I can call my own in the end. Amazing collection of recipes for all things baked savory or sweet rustic to refined amazing travel and works of art from each local. The flavors and aromas jump off the pages ... I can't wait to bake my way through all theme books but I will be starting with this third one. An absolutely beautiful bread book. I really struggled through maintaining a starter/leaven, and this book made me feel that it was doable. It might be difficult to cut one's teeth with these recipes, but they deserve repeated attempts. Nothing feels like pulling open an amazing loaf of homemade sourdough! Were I a bread baker, this book may have been more my cup of tea. Everything looked chewy and healthy--not that that is a bad thing, it's just the impression I am left with. In its favor, this book would be an excellent primer for bakers seeking to explore baking with whole grains, including some dessert offerings. Caveat: what the desserts lack in a sense of decadence, they make up for with a sense of fiber. The recipes in this book are so far out of my current baking skills range that it's a little laughable, but I found the history/tradition bits & information about baking (tartine-style) bread with whole grains really interesting. The breads & grains & process are really beautifully captured in the photographs. This is definitely a book I would want in my library in the future as I work on advancing my bread baking skills. And bread notes from Denmark, Sweden, Germany and Austria, France, Mexico. I was thrilled to find out there's a Brotfest (Bread Festival) in Austria not far from my husband's house. I might be able to go! Tartine No 3 is beautiful, and was obviously a massive project of love. The book has a strong aesthetic style and the results of the recipes all sound great. However, this feels like a thesis and not a cookbook. As a beginning baker (not a complete noob, but not an expert) I found it to be inaccessible. An advanced continuation of Tartine Bread - you must be an advanced bread baker to appreciate the nuances of this book especially versed in the levain style natural fermented breads. The adage of whole grain explored in this book will tempt you to expand your bread making horizons. Inspiring but hardly adaptable to the baking standards of the average household kitchen in real time. You would need a personal assistant to keep up with the timing required to pull off any of these recipes. More of a retirement project than a usable cookbook for me at this stage. I am definitely making a sourdough starter after reading this. I'll also be trying some of these 2 and 3-day rises with ridiculous amounts of water if I can get the same results. I may never make this basic bread recipe. It's really involved. But by god I read this book. The only reason I didn't give it 5 stars is because I wanted more. This is the perfect compliment to the original tartine book. I love all the whole wheat spin offs to the original country loaf and the creative desert recipes. Can't wait to try them! Beautiful book - Great photos, love the font, love the feel of the book. Breads and desserts layed out simply, as if anyone could make them....a bread lovers dream book. great book with recipes using different grain flours, many of them gluten free. my kids even like the recipes. Excellent but not for the beginner. Experienced bakers can learn from this. Meer nog dan Tartine Bread is dit boek voor mij hét referentiewerk voor desembrood geworden. This book has a variety of selection. The problem is the index system is somewhat confusing. Some. The recipes are not quite easy to perform.